The big mobile Cheltenham-born lock John Etheridge played 117 games for Gloucester between 1984 and 1990. He played for England B and three times for the South West Division while a Gloucester player. He joined Northampton in 1990-91 and at the end of that season switched his allegiance to Ireland, touring New Zealand with the full Irish side and playing several games for Ireland A. He also played for Blackrock College, Connacht and Irish Exiles. John Robert Etheridge was born on 8 June 1965 in Cheltenham. He was educated at Longlevens School and played his junior rugby with Gloucester All Blues and then Old Richians. Etheridge made his debut for Gloucester in the 1984-85 season but established himself in the Gloucester second row in 1986-87 in partnership with Nigel Scrivens or John Brain. He became a regular for the next three seasons and began to attract the attention of the regional and national selectors. He played for England B in a 44-0 defeat of Italy B on 19 March 1989 and the following season played for the South West in all three of their divisional games. Competition for second row places at Gloucester was fierce in 1989-90 and he struggled to retain his place. In 1990 he left the club, spent a summer playing in Australia and joined Northampton where he formed part of a powerful lineout that included Tim Rodber and Martin Bayfield. He continued to be selected for the South West Division for all three games in 1990-91 but in the following 1991-92 season he switched his allegiance to Ireland (his father was Irish and he had dual qualification). In March 1992 he came back to Kingsholm with Northampton. The Saints beat Gloucester 17-10 in a John Courage Championship game – their first win at Kingsholm for 30 years. A tour of New Zealand with the full Irish team followed in the summer, in which he missed out on an international cap but played in four provincial games. In 1992-93 he was selected for two Ireland A games and played against an England A side which included Kevin Dunn with whom he’d played for England B four years earlier. 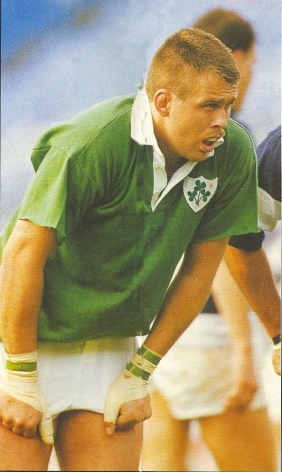 In 1993-94 John played for Connacht in the Irish Provincial Tournament (accredited as a Blackrock College Dublin player); he played in the final Ireland trial and in all three Ireland A internationals. He also played for Connacht in 1994-95 but no further international recognition came his way. The following year he played in the Irish Provincial tournament for the newly formed Exiles XV, once more accredited to Northampton. In 2000 John Etheridge joined RC CMSG, a club situated on the borders of France and Switzerland near Geneva, with grounds in both countries. He was their coach for several seasons. RC CMSG plays in Division 1 of the Swiss League.